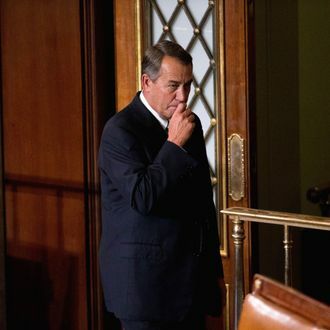 John Boehner thinks retirement feels “weird,” Politico reports. He’s traded being Speaker of the House for being vacuumer of his apartment. Boehner teared up a few times when reminiscing about his favorite Speaker moments, including meeting Pope Francis, according to the Naples Daily News. He is dividing his time between his condo on Marco Island, Florida; his Cincinnati home; and Washington, D.C.
Boehner has “no job, no office, hardly any staff.” But he has some staff. He recently hired Squire Patton Boggs partner Dave Schnittger to handle media, and he has two more staffers covering political matters and keeping track of his appointments, Politico reports. There’s also likely a book deal in the works and lots of paid speechifying.